There’s an interesting chapter in the new book All Man! 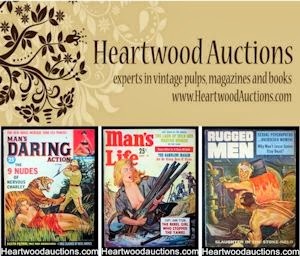 Hemingway, 1950s Men’s Magazines, and the Masculine Persona, by David M. Earle, that discusses how the post-WWII men’s adventure magazines helped American military veterans cope with what is now called “post traumatic stress disorder,” or PTSD. PTSD — known as “battle fatigue” or “shell shock” in previous decades — is discussed and dealt with more openly and directly today than in the more restrained 1940s and 1950s. And, there is now more recognition of how important and therapeutic it is for veterans to talk about their traumatic wartime experiences, especially with other veterans. 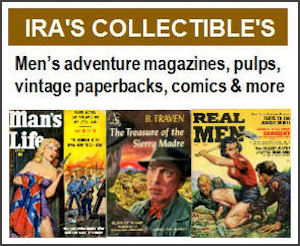 In their time, men’s adventure magazines provided one way for vets to have such “conversations.” They published non-fiction and fiction stories about the gut-wrenching, bloody realities of war, about what it was like to be a GI, to see friends killed, to be wounded, to be a prisoner of war, to survive hell. 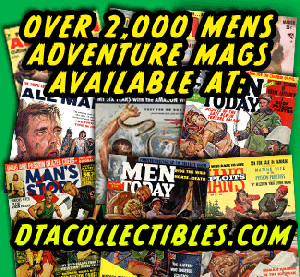 The men’s adventure magazines also had what we might now call “interactive” forums, where veterans could “post” notes and letters, and communicate with former war buddies. The August 1957 issue of Battle Cry is a good example. Its moving cover painting was done by the talented artist Mal Singer (1911-1974), who created covers and illustrations for many pre-WWII and postwar magazines and books. 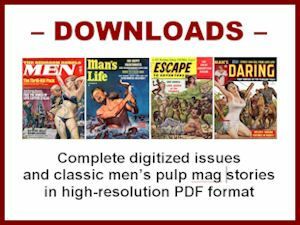 Like most cover paintings on men’s adventure magazines, Singer’s tells a story. We see two GIs in a foxhole. One has the “thousand yard stare.” The other is reaching out to try to save a lost puppy who wandered onto the battlefield. It’s a brilliant glimpse of soldierly compassion and vulnerability in the midst of war. 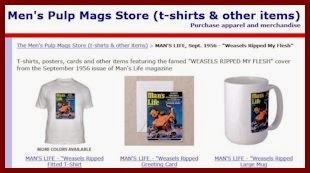 Inside the August 1957 issue of Battle Cry, there are several monthly “departments” that show how some of the men’s adventure magazines helped war vets interact with each other — almost like an online forum does today for people who share certain interests or problems. To my great surprise and pleasure, Harlan recently contacted me about my blog and said he’d tell me some anecdotes about that story and his noir-like “Death Climb” tale, which I mentioned in a previous post. I’m definitely looking forward to that conversation!